Odisha Mining Corporation Ltd (OMC) invited applications for recruitment to 38 Managerial posts. The candidates eligible for the post can apply through prescribed format on or before 23 September 2016. Eligibility for posts in Finance Department: Associate/Fellow Member of ICAI/ICWAI. Preference shall be given to the candidates having experience in SAP-FICO Module. Eligibility for posts in Personnel Department: MBA/PGDM in Personnel/HR/ Industrial Relation from recognized Institute approved by AICTE or Masters /Post Graduation in Social Welfare/ Labour Welfare/ Industrial Relations/ Personnel Management or equivalent from a recognized University/ Institute approved by AICTE. Eligibility for posts in Mechanical Department: BE/B. Tech in Mechanical Engineering from recognized University or Institute approved by AICTE. Eligibility for posts in Company Affairs Department: Graduation from any recognized University with an Associate Member of Institute of the Company Secretaries of India. Eligibility for posts in Electrical Department: BE/B. Tech in Electrical Engineering from recognized University or Institute approved by AICTE. Eligibility for posts in Civil Department: BE/B. Tech in Civil Engineering from recognized University or Institute approved by AICTE. 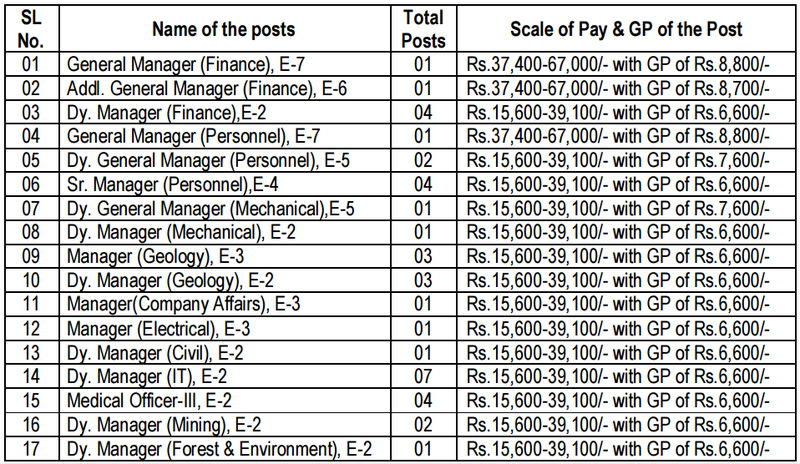 Eligibility for posts in Mining Department: BE/B.Tech. in Mining Engineering with 1st /2nd Class MMCC. Preference shall be given to the candidates having Unrestricted Competency. Eligibility for posts in F&E Department: BE/B. Tech in Environmental Engineering from an University/ Institute recognized by AICTE. Eligible candidates can apply to the post through online mode at the official portal of the website.